Update 1 (4/17/19 @ 2:00 PM IST): Samsung Galaxy A70 launched in India for a price of ₹28,990 (6GB+128GB). It can be pre-booked starting April 20, 2019. Samsung has been bracing itself to beat the price-effective smartphone offerings from Chinese brands like Xiaomi, Huawei, OPPO, Vivo etc. To do so, the South Korean tech giant has revamped its Galaxy A series, which primarily comprises budget offerings with a premium touch. While the Samsung Galaxy A10, Galaxy A30, and Galaxy A50 are already available in select markets including India, Samsung has reportedly been working on more devices to be added in this series. 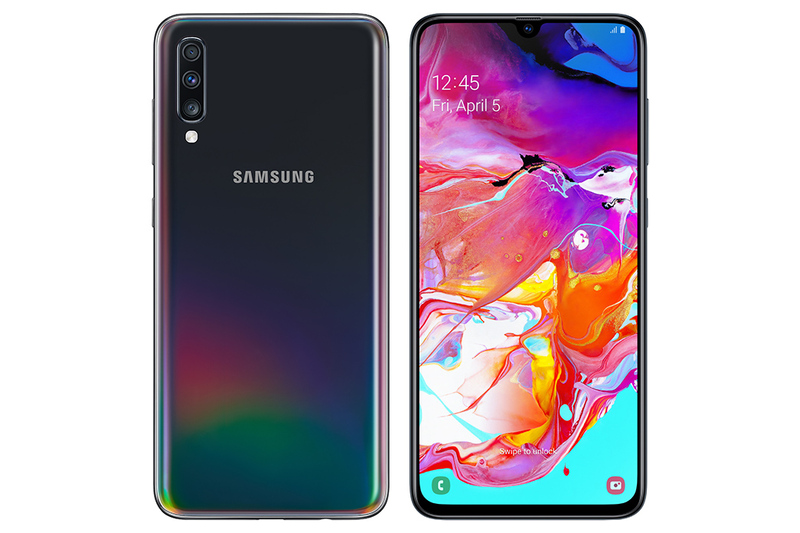 Moving forward, the company has now pulled the wraps off Samsung Galaxy A70, which comes with a large Infinity display, triple rear cameras, and a host of exciting colors which are visibly borrowed from the Samsung Galaxy S10 series. Among the features that make Samsung Galaxy A70 intriguing is its 6.7-inch Infinity-U Full HD+ Super AMOLED display which also houses the fingerprint scanner. With minimal bezels and a 20:9 aspect ratio, the Galaxy A70 serves an immersive experience. The on-display fingerprint scanner also supports Samsung Pass which can be used to log into websites or protect app content and files or media stored on the smartphone. In terms of cameras, the Galaxy A70 has triple cameras on the back, comprising a 32MP primary sensor, an 8MP ultra-wide sensor, and a 5MP depth sensor. For selfies too, the smartphone uses a 32MP shooter. For its performance, the Galaxy A70 relies on an unknown octa-core chipset – presumably from the Exynos family – and comes with options between 6GB and 8GB of RAM. It features 128GB of onboard storage which can be expanded by up to 512GB using the dedicated microSD slot. Samsung Galaxy A70 packs in a massive 4,500mAh battery which supports super-fast charging at 25W. The battery, says Samsung, can easily suffice for a day's demanding usage. For the smartphone's back, Samsung is using a "3D Glasstic" material which seems to be plastic with the appearance of reflective glass, just like last year Galaxy A9. The Galaxy A70 comes in four colors – coral, black, blue, and white – and all of these have subtle gradients. For its software, Samsung Galaxy A70 runs One UI based on Android 9 Pie with inbuilt features like one-hand navigation, Night Mode, App Timer, and the standard suite of Samsung apps. Samsung has not revealed the price of the Samsung Galaxy A70 and will be doing so at the event it is holding on April 10th. At this event, we also expect Samsung to unveil the Galaxy A60, which was recently certified by TENAA along with the Galaxy A70, as well as the Galaxy A90, which might be Samsung's first smartphone with a pop-up selfie camera. After the Galaxy A series launch event at Bangkok last week, Samsung has announced that the Galaxy A70 will be available for pre-booking in India between April 20th and 30th. The 6GB RAM variant will be priced at ₹28,990 in India, although we're yet to confirm whether the 8GB variant will be sold in the market too – or not. Those who pre-book the device will get the Samsung U Flex Bluetooth headset for ₹999, against the usual price of ₹3,799. The smartphone will be available in India via offline retail stores, Samsung's e-store, and Flipkart. In India, only the white, blue, and black colors will be available. Meanwhile, Samsung India has also revealed that the Galaxy A70 will be powered by a Snapdragon 675 processor, clearing any earlier claims that it could be powered by the new Snapdragon 730G. The article has been updated accordingly to reflect the change. The post [Update: Coming to India for ₹28,990 on April 20] Samsung Galaxy A70 debuts with 6.7″ Infinity-U AMOLED, 32MP front and rear cameras, 25W fast charging appeared first on xda-developers.